On Thursday June 2nd, SickKids: Scrubs in the City will host a royal vs. rebel bash at Evergreen Brick Works. We’re SO EXCITED for the London theme, because when it comes to fashion, who doesn’t love choosing between THIS or THIS? SO FUN! Are you a little bit obsessed with Kate Middleton? (Just a little.) Or do you prefer to channel a young Vivienne Westwood? Pastel blazer or leather and chains? 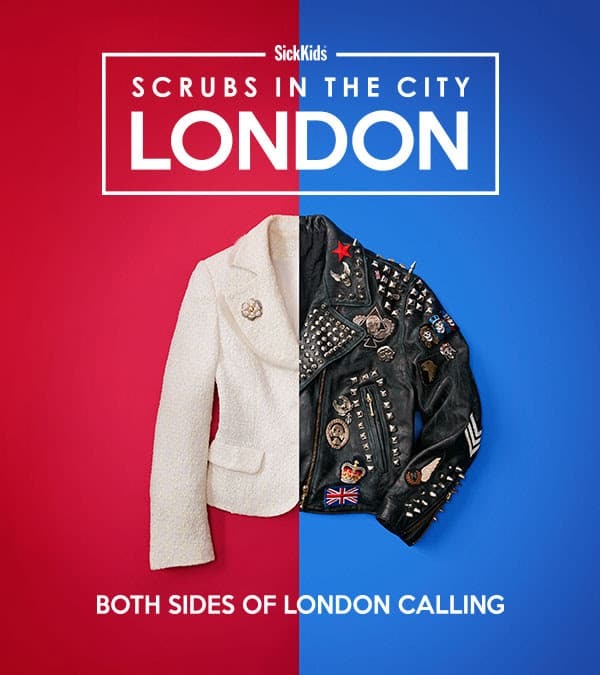 London is a city of contrasts, and they’ll all be on display at this year’s Scrubs in the City, where the theme is London, and the cause is SickKids. So come as the London you are (or want to be). It’s time to eat, drink and donate to the heartbeat of the city. A terrific party, a beautiful way to usher in warmer weather, and a cause near and dear to our heart: We love Scrubs in the City for many reasons. We are so blessed to have SickKids in Toronto, and we hope you will join us on June 2nd for this memorable night. General admission: $195/ticket. Buy 8 or more tickets $175/ticket. More details here. By attending Scrubs in the City 2016, you’re doing so much more than hitting the highlight of the social calendar. You’re raising funds for a new 3T MRI machine at SickKids. Quieter, faster, bigger, and more powerful, it will make the MRI experience less stressful for kids and family. And give SickKids clinicians the best-in-class technology to deliver best-in-class care. Deinately an event I will attend a good cause and a good time out.